Promises made by the City of Cape Town in relation to job creation for taxi drivers,gatjies and taxi washers affected by the implementation of the MyCiTi bus service, are not being honoured. The affected members along the West Coast who are now without jobs after taxi bosses received compensation and surrendered their operating permits and taxi vans, told shadow MEC for Transport and Public Works, ANC MPL Cameron Dugmore, that the MyCiTI bus service had taken away their livelihood. Dugmore has formed a committee which is visiting areas where MyCiTi has been implemented to gather information on problems associated with the bus service in order to compile a dossier and organise a problem solving meeting with Cape Town mayor Patricia de Lille, City mayco member for transport, Brett Herron, and the national Department of Transport. “We cant have billions from national government pumped into MyCiTi bus service while promises to employ taxi drivers,gatjies and taxi washers has been broken and the service to many of the commuters is not what it should be,” said Dugmore. “There is a great deal of unhappiness in the way the MyCiTi bus service has been implemented in Cape Town,” he said. Speaking while meeting affected parties in Atlantis, he said his committee will listen to grievances from affected taxi industry members in Hout Bay, where MyCiTi was implemented at the beginning of the year. “We want the Bus Rapid Transit system to work but the City must be serious in dealing with the problems,” he said. Regan Carelse, 38, has been a taxi driver for the past eight years under the Blaauwberg Taxi Association (BTA) in Atlantis. He is now working as a MyCiTi bus driver employed by Vehicle Operating Company (VOC) Kidrogen, and earning R7200 per month before deductions. Carelse said as a taxi driver, he earned about R13 000 a month. He said about 60% of his colleagues at BTA are now unemployed following the roll out of the MyCiTi bus service along the west coast corridor. 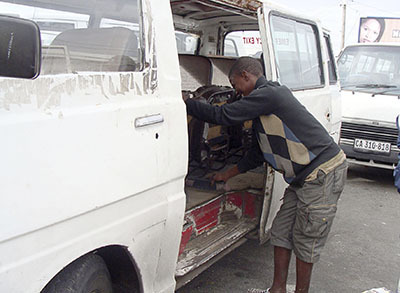 Now, together with unemployed taxi drivers, they have teamed up with other taxi bosses and drivers in Witsand and they are forming a taxi association to operate taxi’s as the service was in high demand in the area, he said. But their taxi service was likely to be operating illegally, as City has stopped issuing operating licenses in the areas where MyCiTi is operating. In the meantime, Hout Bay taxi bosses share the same grievances. “We welcome Dugmore’s interventions. MyCiTi is driving directly on our routes and we haven’t been compensated,” said Malibongwe Gqobola, the association spokesman. Herron said the City had asked VOC’s to add the names of all their affected full-time employees to a register from which the City would require all MyCiTi contractors to employ at least 75% of all their registered staff.